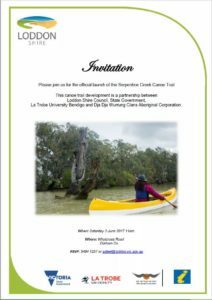 The LPLN are happy to announce the Official Opening of the Serpentine Creek Canoe Trail. 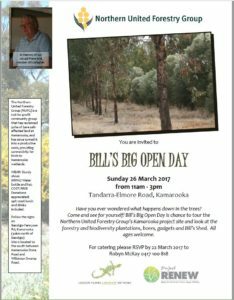 This program that was first ‘floated’ by Laurie Maxted of the Loddon Vale Landcare group and Board Member of the LPLN. La Trobe University Bendigo and Dja Dja Wurrung Clans Aboriginal Corporation. When: Saturday 3 June 2017 11 am. Spit roast lunch and drinks included. Reminder. This is on Sunday 26th March. 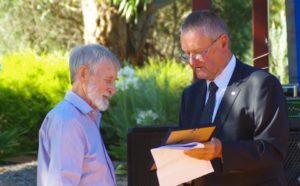 Congratulations to Michael Moore, Secretary of the Loddon Plains Landcare Network’s Committee of Management, the President of the Wedderburn Conservation Management Network and a member of the Friends of Kooyoora National Park. 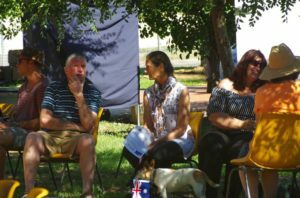 Michael was awarded the Wedderburn Community Service Award from the Loddon Shire at the Australia Day awards ceremony in Wedderburn. This is on top of being recognised by Parks Victoria and awarded an individual Kookaburra award just a few months ago. 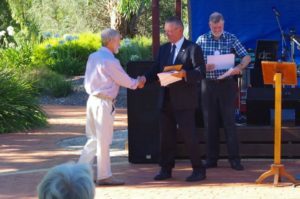 To our knowledge, this is the first time a Community Service Award has been awarded by the Loddon Shire for conservation work, and is seen as a positive sign by the Landcare and conservation communities. 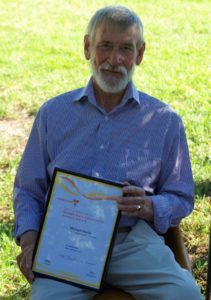 Michael has volunteered many, many hours, working for the Wedderburn CMN, Loddon Plains Landcare Network and the Friends of Kooyoora. 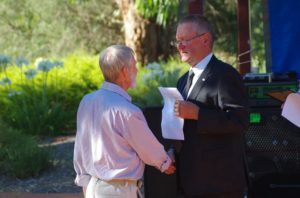 He has been a key driver in protecting our local Mallee Fowl population, putting together projects to improve local habitat and building connectivity between key sections of our environment. 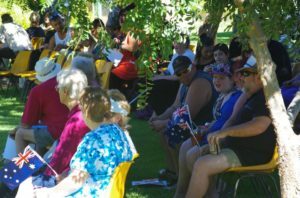 It was great to see so many members of the local community, celebrating Australia day together. 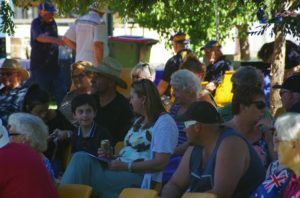 The success of the day was guaranteed by the fantastic work from the Wedderburn Lions Club and the Loddon Shire, ensuring such a great day. Well done, and thank you, Michael. The FTLA and VLC are holding special general meetings of the Association to formally approve the measures which will merge the two organisations and move to the new Landcare Victoria Incorporated. This is the key legal step in enacting the merger, endorsed by members at the 2016 Annual Forum. Since that meeting the committees have worked assiduously to prepare the groundwork for the merger to take place. We are currently working hard on the essential detail, new logos, integrating websites, bringing together the various work of the paid staff within both organisations, and key decisions / actions for the committee to ensure a seamless continuation of service to you, the members, during this period of bringing all parts of both groups together. 1. Accept the terms of the merger of the Victorian Landcare Council Inc with the Farm Tree and Landcare Association Inc as specified in the “Merger Implementation Deed”. 2. Adopt the new rules for the Association as circulated, which give effect to the merging of the Association with the Victorian Landcare Council Inc, to take affect 3rd April 2017. 3. In adopting these new rules, the name of the Association be changed to Landcare Victoria Inc.
4. Appoint as at 3rd April 2017, per rule 26.2 of the new Rules the following people to the committee of management: Terry Hubbard (Strath Creek Landcare Group), David Clark (Upper Mt Emu Creek Landcare Network), Kaye Rodden (Barrabool Hills Landcare Group), Artur Muchow (Middle Yarra Landcare Network), Sandy McKenzie (Burnt Creek Landcare), Belinda Brennan (South Gippsland Landcare Network), Peter Berrisford (Bellarine Landcare Group), Phillip Horner (Ovens Landcare Network), Mike Haughton (Neerim Landcare Group), and Anthony Dufty (Moorabool Landcare Network). 5. Recognise the outstanding service of the outgoing committee members of the FTLA, namely Karen Alexander (7 years), Alex Arbuthnot (12 years), Susan Campbell and Richard Jamieson as founding members of the FTLA (30 years) and thank them for their valued contribution to Landcare. We look forward to your active participation in the Special General meeting and encourage any questions which you have be directed through the FTLA Office to our Committee of Management members. Only members that hold voting rights may vote at this meeting. The Australian Government’s Department of Social Services is inviting volunteer-based community groups and networks to apply for the 2016 Volunteer Grants funding. These grants aim to support the efforts of volunteers by providing small amounts of money that organisations and community groups can use to help their volunteers. Funding for: community-based groups and networks to buy equipment (e.g. computers), or help with training volunteers, fuel costs or undertaking background security checks etc. See guidelines (via link below) for a comprehensive list of eligible and ineligible items. Please forward to your groups and networks. Congratulations to both the Wedderburn CMN and The Friends of Kooyoora! Both of these LPLN member groups have been nominated for a Parks Victoria, 2016 Conserving Special Places, Kookaburra Award. 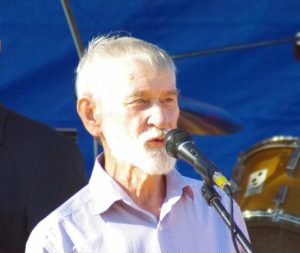 On top of that, both Michael Moore (President of the WCMN and Secretary of the LPLN) and Jim Irving (Friends of Kooyoora) have been nominated for an Individual Achievement Kookaburra Award. These two amazing people deserve this recognition for their outstanding achievements and commitment over many years. Award nominations are currently being assessed by a panel, comprised of persons recognised for their expertise in the areas of community and conservation. I’d like to say well done and thank-you to Jim Irving, Michael Moore, the Friends of Kooyoora and the WCMN for all for their great work. 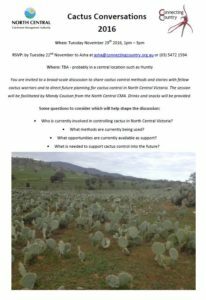 Here is the invite to Cactus Conversations at last! Mandy from NCCMA will be facilitating the day, and once we know the venue we’ll send it out to those who RSVP. Pest animals & weeds cost our farmers around $4 billion every year. Funding is now available to improve how they are managed in Australia. To be eligible for funding, projects must propose to develop a chemical, biological or physical control tool or technology to manage one or more established pest animals (excluding invertebrates) and/or weeds that are not native to Australia or a particular part of Australia. Are you a property owner or Landcare member working to manage rabbits? Wondering what to do next? The North Central CMA is pleased to bring Dr Tarnya Cox (Invasive Animals CRC) back to the region to present the 2016 Rabbit Buster Roadshow. Tarnya is leading the national scientific research campaign to reduce the devastating agricultural and environmental impact of rabbits. She will also discuss current research to find a new strain of Calicivirus and efforts to improve the biological control of rabbits. A local Landcare group or network will host each session and share their story on rabbit management. An abundance of information and rabbit-management resources will also be available for participants to take away from each session. RSVP now to hop on board this unique opportunity. Grab your ticket today to sign up for this great event series. Walk in’s welcome on the day. For catering purposes, please add any dietary requirements you have in the ticket notes. CLOSED: Dairy Development Grants are fully subscribed and are now closed. Update: this grants scheme is fully subscribed and is now closed. 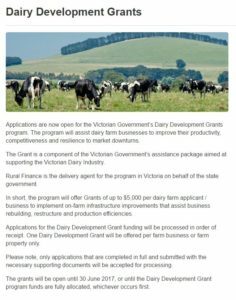 These grants will be open until 30 June 2017, or until the Dairy Development Grant program funds are fully allocated, whichever occurs first. If you have queries about the Victorian Government’s Dairy Development Grants program, please call us on 1800 260 425 (free call) or email industryprograms@ruralfinance.com.au.